Philip Lyons is a poet who combines straightforward language with technical mastery. Like It Is, his first full length collection, draws on a writing career spanning three decades. The themes are the universal ones of love and loss. However, what gives these poems their strength is their quiet determination to celebrate being human in spite of all the reasons not to. 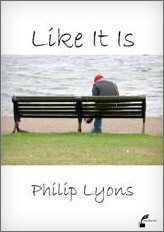 A collection to return to again and again, Like It Is is notable for its emotional honesty and reveals an original voice, both compassionate and witty, addressing the reader as an equal in a conversation about the complex nature of relationships and sharing the impulse to record experience against the passage of time. the prairies where a cowboy has his roots. I’ll lie beneath the stars and smoke cheroots. This terraced house I live in cramps my style. and tells me everything I need’s at home. She’s frightened of the distance in my eyes. and nothing else will still this urge to roam. I’ll only be away a month or two. but don’t come looking for me if you do. I’m going where a cowboy can be blue. It’s something cowboys have to do alone. “There is a deep faithfulness in this poetry – no straining after the exotic, but a commitment to the common ground of lived experience. It holds true, with deft forms and lucid language and a quiet wit. Philip Lyons’ writing is of a piece with his teaching and his therapeutic work, an example of how anybody’s life gains meaning in this clear impartial light”. Sue Boyle Organiser of the Bath Poetry Cafe . Sue’s pamphlet: ‘Too Late for the Love Hotel’ was a Poetry Business prize winner was published by Smith/Doorstop in 2010.